(Nanowerk News) The race to make computer components smaller and faster and use less power is pushing the limits of the properties of electrons in a material. Photonic systems could eventually replace electronic ones, but the fundamentals of computation, mixing two inputs into a single output, currently require too much space and power when done with light. Researchers at the University of Pennsylvania have engineered a nanowire system that could pave the way for this ability, combining two light waves to produce a third with a different frequency and using an optical cavity to amplify the intensity of the output to a usable level. The study was led by Ritesh Agarwal, professor of materials science and engineering in Penn’s School of Engineering and Applied Science, and Ming-Liang Ren, a post-doctoral researcher in his lab. Other members of the Agarwal lab, Wenjing Liu, Carlos O. Aspetti and Liaoxin Sun, contributed to the study. It was published in Nature Communications ("Enhanced second-harmonic generation from metal-integrated semiconductor nanowires via highly confined whispering gallery modes"). Light emitted from the underside of the cavity. THe dotted outlines represents the orientation of the cadmium selenide nanowire. The difficulty inherent in “mixing” light may seem counterintuitive, given the gamut of colors on TV or computer screen that are produced solely by combinations of red, green and blue pixels. The yellows, oranges and purples those displays make, however, are a trick of perception, not of physics. Red and blue light are simply experienced simultaneously, rather than combined into a single purple wavelength. So-called “nonlinear” materials are capable of this kind of mixing, but even the best candidates in this category are not yet viable for computational applications due to high power and large volume constraints. A schematic of the optical cavity. To reduce the volume of the material and the power of the light needed to do useful signal mixing, the researchers needed a way to amplify the intensity of a light wave as it passed through a cadmium sulfide nanowire. The researchers achieved this through a clever bit of optical engineering: partially wrapping the nanowire in a silver shell that acts like an echo chamber. 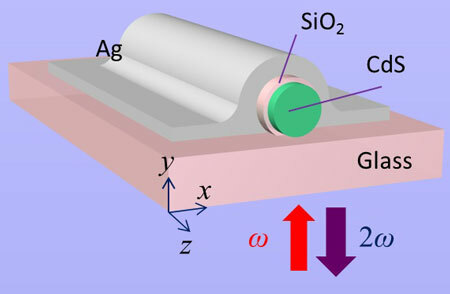 Agarwal’s group had employed a similar design before in an effort to create photonic devices that could switch on and off very rapidly. 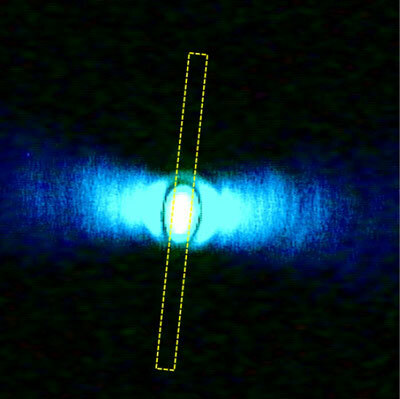 This quality relied on a phenomenon known as surface plasmon resonance, but, by changing the polarization of the light as it entered the nanowire, the researchers were able to better confine it to the frequency-altering, nonlinear part of the device: the nanowire core. “By engineering the structure so that light is mostly contained within the cadmium sulfide rather than at the interface between it and the silver shell, we can maximize the intensity while generating the second harmonic,” Ren said. Like a second harmonic played on a guitar string, this meant doubling the frequency of the light wave. Information in a photonic computer system could be encoded in a wave’s frequency, or the number of oscillations it makes in a second. Being able to manipulate that quality in one wave with another allows for the fundamentals of computer logic. Most important, however, was that this frequency mixing was possible on the nanoscale with very high efficiency. The researchers’ optical cavity was able to increase the output wave’s intensity by more than a thousand times.